Here I am!!! 5:00 and trying to study some more English!!! It’s been two weeks since I started to study for the TOEFL test! Thanks to Reiko’s mother and Sensei I’ve got a lot of materials to study!!! XDD My records at Listening and Reading are wonderful!! But I still have to improve my Writing and learn to Speak slower! My problem with the writing is that I got spoiled by the spellchecker! Even in Portuguese (my mother-language) I have some spelling problems!! Oh… well… I still have some time!! When I got too tired to formal study I read one of my English books! 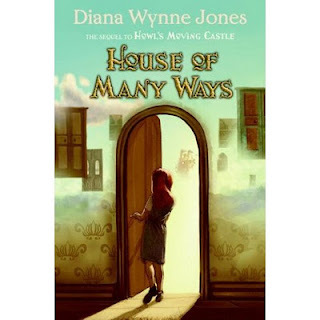 At the moment, I’m reading “The House of Many Ways” of Diana Wyenne Jones! She’s the same author of “Howl’s Moving Castle”, which was adapted to the Movie Theater for Hayao Miyazaki! Yes… the same director who’s made Sen to Chihiro no Kamikakushi! (Spirited Away, in English and A Viagem de Chihiro in Portuguese). I bought the Howl’s book after watch the movie! And, although there’s some differences from the movie, I liked very much! And try to find out some other books of Ms. Jones! I keep on My Way to the North Sea! Hope in some months I’ll really be there! Not only on my dreams! !